Tuesday, 17 May 2011 Fiddleheads from the foragers at my farmers market! Instead of following Rick's recipe to the letter, I attended to the headnote, in which he talks about eating fiddleheads raw rather than cooking them, then applied that lesson to the recipe and served the whole dish raw. Mixed colors of radishes, also from the farmers market, red, black, maroon, pink, cream, and white. Raw fiddleheads are a great texture food, kind of like crunching a serpent. I can see having this dish every year to mark the arrival of ... well, not the arrival, but the hope of spring. It will come. It will. Yes, this recipe was chosen to practice using an aspic, something I haven't done for years. I used bucheron cheese, as suggested, both because it is a favorite and I had some in the fridge. For microgreens, I used Micro greens hippie salad mix ... which is another way of saying, I don't actually know what I used. No, there wasn't the great color contrast of the cookbook's photo. I deliberately left the cheese puree on the thick side. The aspic itself is quite flavorful made entirely from the recipes in this book: Vegetable stock (pg. 243) and Vegetable aspic (pg. 250). The result is a beautiful and delicious amuse-bouche that is actually rather easy to make if you plan far enough ahead. For me, planning ahead began with starting a new batch of microgreens. This could easily be presented as a salad rather than as an amuse-bouche. It is necessary to start with dried chickpeas to get the flavor of the bouquet garni. The recipe is somewhat time consuming, roasting garlic, roasting and peeling peppers, finding an appropriate feta ... The result is a very nice bite but I'm not sure its really worth the effort. I'm more apt to make a salad with the same flavor profile than to repeat this recipe. While chefs at many fine restaurants offer guests an amuse-bouche to welcome them, nobody does it better than Rick Tramonto, the celebrated executive chef/partner of Chicago's TRU--one of Conde Nast Traveler's Top Fifty restaurants in the world in 2000. With the publication of this book, Tramonto aims to share this delicate, delicious world with a mainstream audience. 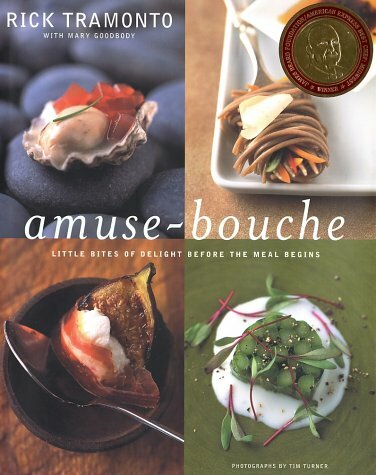 Amuse-bouche are, to us, what hors d'oeuvres were to Americans in the 1950s--a relatively unknown but rapidly embraced French culinary tradition. Rick Tramonto's beautiful and lighthearted, if sometimes zany, recipes will inspire home cooks and professionals alike to let their imaginations soar. These preludes to a meal can be as provocative and inventive as one chooses--from Black Mission Figs with Mascarpone Foam and Prosciutto di Parma to Curried Three-Bean Salad. With more than one hundred recipes and fifty full-page color photographs, the book will satisfy your eyes as much as the amuses will please your tastebuds.